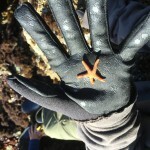 If you haven’t ever gone tide pooling, you certainly need to. It’s a fun and unique experience. My family has gone several times, and each time brings something new and interesting. The best time to go is at low tide, and if you can catch a minus tide it is even better because more areas are exposed for exploring. The first time we went it was perfect. We were staying at Half Moon Bay near San Francisco. We had to get up at 5 in the morning to make it during a minus tide. We climbed across several rocks, slipping with style (not really), as we walked/ran/slipped on the seaweed slopes. Cucumbers of all sizes had gathered in clusters. 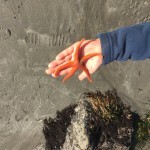 My sister found an uncovered sea anemone and went to touch it but she got stung. 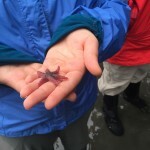 We saw small sea stars, sea anemones and other creatures that we could not identify. 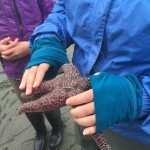 Unfortunately, after that we weren’t in areas that had good tide pooling. 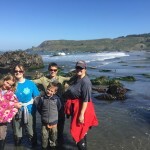 When we went this last time we went to Lone Ranch, which is a beach close to Brookings OR. 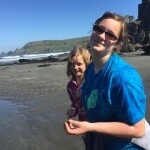 Finally at our newest home, Gold beach, we were able to try it out again. 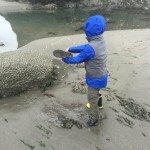 The waves had receded, exposing, rocks, caves, crevices, and little pools of water, where you could occasionally get a glimpse of small fish and baby crabs. We started with some rocks. We climbed over them, stopping to admire all the life. 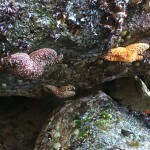 Sea cucumbers and barnacles left several of the rocks completely covered. 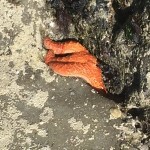 Large starfish stuck themselves to the bottom of rocks. They were pretty good hiders. We were halfway through all the rocks before mom noticed one. 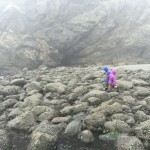 After the rocks we went around to the smallish pools left behind by the ocean. Small fish and crabs occupied them. I had the pleasure of falling in one of them after the sand sucked me in, ankle deep and I tried to move too quickly. After seeing several small pools, we went to check out some caves, and cliff rocks. 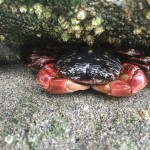 They had an abundance of small sea anemones and crabs. After that, the waves started coming in and it was time to go home. When we went a third time we decided to go somewhere different. I think it was slightly off the area of Lone ranch. I don’t remember what it was called though. Giant rocks were all spread around, and several forms of life had attached themselves to them. In small pools, the sea cucumbers were out and resembles green anemones with the way the seemed to glow (I think certain species of anemones do glow in the dark). When a wave came in and swam around where we were standing Brandon fell backwards. I attempted to catch him but he yanked me along, thus ending any attempt to stay dry. A few weeks later, we decided to go to the same place again and this time we invited friends. Guess what? I didn’t fall in this time. Instead my dad and sister went out to a rock and made it just as heavy waves came in. Mom and Brandon didn’t follow but I on the other had went in Just as a wave came in, taking me from ankle deep to waist deep in three seconds. My dad and sister waited to get back but the water never really receded so poor Jessica had to jump in cold, waist deep water. After that we hung out with our friends, checking the water level in our boots (mid-calf for me, new record). Once we were dry enough to go back to our vehicle we left.